BACKGROUND: Pauci-immune crescentic glomerulonephritis is one of the most common causes of rapidly progressive glomerulonephritis, usually associated with anti-neutrophil cytoplasmic antibody (ANCA) but a minority of patients lack ANCAs. To date no effective treatments have been addressed for ANCA-negative glomerulonephritis despite several studies describe the possibility to adopt pharmacologic therapies. Cellular, molecular and preclinical studies demonstrate that mesenchymal stem cells (MSCs) contribute to glomerular cell turnover and repair and might represent a new therapeutic approach for ANCA-negative glomerulonephritis. AIM: In our study we presented a case report of a patient with ANCA-negative pauci-immune glomerulonephritis in order to underlie the growing need of an alternative therapy for glomerular diseases. MATERIALS AND METHODS: We report the case of a 69 year-old woman who presented to our department with diarrhea, vomiting and increased serum creatinine levels. At the First Aid Department, renal ultrasonography excluded dilatations of urinary tract and since the occurrence of progressive dyspnea, anuria and severe hypertension renal replacement therapy was started. RESULTS: A second kidney Doppler ultrasonography showed hyperechoic parenchyma, reduced thickness and increased resistive index. Urinalysis revealed persistent active sediment and proteinuria. Autoimmunity profile showed C3, IgE and IgM increased levels. 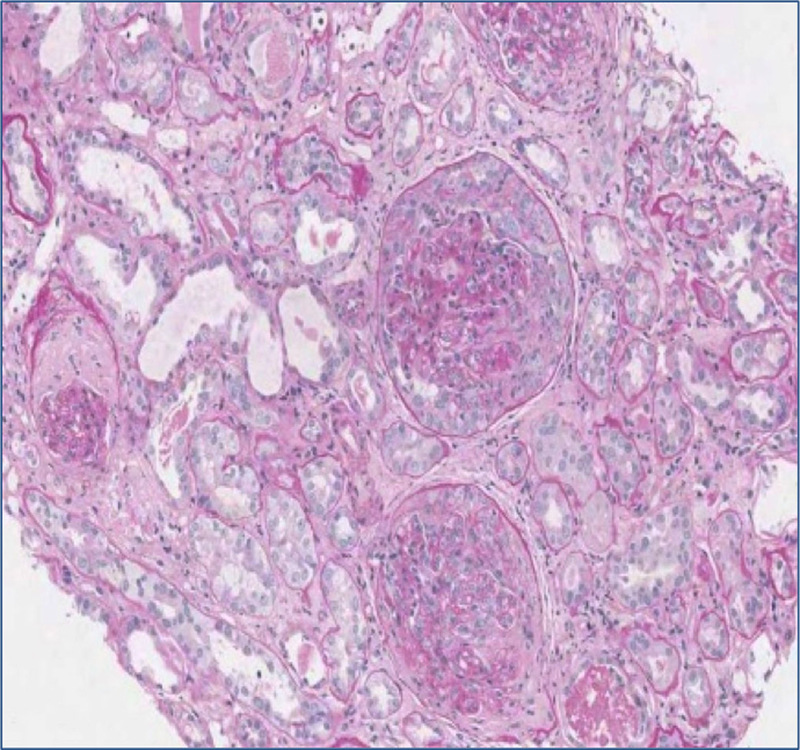 Renal biopsy was performed showing diffuse extracapillary proliferative glomerulonephritis with negative Immunofluorescence (IF). ANCA test was negative for a second time by both IF analysis and antigen-specific ELISA. The diagnosis was ANCA-negative glomerulonephritis and steroid bolus was administered, improving urinary sediment and proteinuria but not glomerular filtration rate. DISCUSSION: Our data demonstrated that pharmacological treatment of ANCA-negative glomerulonephritis correlated with poor response and is not effective, pointing out the importance of new therapeutic options for this disease. In this regard MCSs may represent a valid alternative in the treatment of ANCA-negative glomerulonephritis. CONCLUSIONS: MSCs may provide an effective therapeutic option in glomerular diseases and future studies should be performed in order to pave the way for this cell-based therapy. Pauci-immune crescentic glomerulonephritis is one of the most common causes of rapidly progressive glomerulonephritis, usually associated with anti-neutrophil cytoplasmic antibody (ANCA). A minority of patients (10-30%) lack ANCAs but differences in renal histopathology and prognosis between ANCA-negative and ANCA-positive pauci-immune crescentic glomerulonephritis remain controversial 1. Moreover the pathogenesis of ANCA-negative pauci-immune crescentic glomerulonephritis is unclear. Neutrophils are the major effector cells in ANCA-positive pauci-immune crescentic glomerulonephritis and probably also in ANCA-negative. In fact recent evidences have demonstrated that neutrophil infiltrations are prominent in the glomerular lesions of individuals affected by ANCA-negative type 2. After the neutrophil activation, the resultant release of oxygen radicals, lytic enzymes and inflammatory cytokines could be responsible for the damage to glomerular endothelial cells 3 , 4. ANCA-negative patients have fewer constitutional symptoms (fever, weight loss, myalgia and arthralgia) and much less extrarenal (lung, eye and ear–nose–throat) involvement than their ANCA-positive counterparts 5. Therefore, ANCA-negative patients have more severe proteinuria and poorer renal outcome, compared with ANCA-positive patients 6. In fact a higher mortality rate is demonstrated especially in older patients, underlining the importance of early diagnosis in the absence of ANCAs 7 8 9. Immunosuppressive therapy is required in ANCA-negative but usually it is suggested in presence of a poor clinical response. Multipotent mesenchymal stem cells (MSCs) represent a promising therapeutic approach in many clinical conditions for their renotropic property and tubular regenerative potential effect. Positive results have been obtained by the infusion of MSCs in patients with ANCA-positive glomerulonephritis, obtaining reduction of proteinuria, prevention of renal dysfunction and improving resolution of glomerular damage 10. In glomerular nephropathies MSCs seem to induce regulatory T-cell phenotype expansion with reduction in interferon-γ, interleukin 6 and tumour necrosis factor serum levels, improving glomerular cell turnover and repair 11 , 12. Therefore we believe that MSC might represent a valid alternative therapy especially in those patients as in the case described herein, which poorly respond to the pharmacologic treatments. Written informed consent was obtained from the patient before inclusion in the case report. We describe a case of a 69 year-old woman admitted to the First Aid Department of our hospital on April 27, 2013 for diarrhea and vomiting lasting 5 weeks associated with increased serum creatinine and blood urea levels at routine blood tests. She had familial history of cardiovascular disease and SLE (her sister). The patient also suffered from arterial hypertension treated with ACE inhibitors, dyslipidemia, alopecia, and underwent knee replacement surgery about 10 years ago. She reported a recent intake of nephrotoxic drugs (NSAIDs) due to knee pain. Routine blood and urine tests showed normal renal function and negative urinary sediment until 2009. Since 2009, the patient did not longer perform any blood and urine tests. Emergency Department laboratory tests showed serum creatinine 12.8 mg/dL, BUN 57 mg/dL; ABG pH 7.35, HCO3 18.6, BE-9. Obstructive nephropathy was excluded by renal ultrasonography. For the occurrence of progressive dyspnea, anuria and more severe hypertension, renal replacement therapy by femoral central venous catheter was started. Since then she became dialysis dependent. On admission to our Nephrology Department (April 29, 2013) laboratory tests showed: serum creatinine 7.4 mg/dL, BUN 100 mg/dL (post-dialysis values). Urinalysis showed pH 5, proteinuria 100 mg/dL and at the sediment, leukocytes 191/microL, red blood cells 114/μL. Repeated renal ultrasonography (May 5, 2013) performed to assess renal resistive indices, showed normal kidney size with increase of parenchymal echogenicity, mildly reduced cortical thickness and resistance indices increased bilaterally (Figure 1). Figure 1. 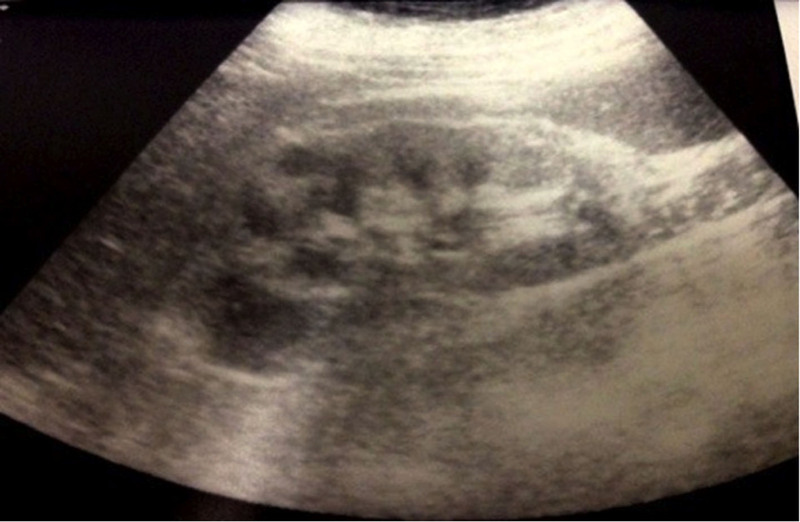 Second renal ultrasonography. Renal ultrasonography showed normal kidney size with increase of parenchymal echogenicity, mildly reduced cortical thickness and resistance indices increased. Courtesy of Prof. Andrea Onetti Muda. Thorax High Resolution Computed Tomography (HRCT) performed in order to exclude a possible systemic involvement of the disease resulted negative. For the persistence at the urinalysis of active sediment and proteinuria 1656 mg per 24 hours, autoimmunity profile (ANA, ds-DNA, ENA, LAC, p- and c-ANCA, C3, C4) was performed showing a rise of C3 component with IgE and IgM increased serum level. Therefore we decided to perform a renal biopsy (May 5, 2013) which showed diffuse extracapillary proliferative glomerulonephritis with cellular crescents (13%), cellular and fibrotic crescents (74%), areas of interstitial fibrosis, tubular atrophy and lympho-mononuclear infiltration (Figure 2 A, B). Immunofluorescence (IF) resulted negative. ANCA test was appraised for a second time by both IF assay and antigen-specific ELISA resulting negative. Figure 2 (A). Histopathological renal examination by Periodic Acid Schiff reaction, x10. Diffuse Cellularity with extracapillary presence of cellular (4 glomeruli) cellulo-fibrotic and fibrotic crescents (25 glomeruli). Fibrotic intimal thickening and delamination of the internal elastic lamina of the arteries, intimal hyalinosis of the arterioles; areas of interstitial fibrosis, tubular atrophy and lympho-mononuclear infiltration (GLM 3): IgA, IgG, C1q, kappa and lambda light chains negative. Courtesy of Prof. Andrea Onetti Muda. Figure 2 (B). Histopathological renal examination by Periodic Acid Schiff reaction, x10. Diffuse Cellularity with extracapillary presence of cellular (4 glomeruli) cellulo-fibrotic and fibrotic crescents (25 glomeruli). Fibrotic intimal thickening and delamination of the internal elastic lamina of the arteries, intimal hyalinosis of the arterioles; areas of interstitial fibrosis, tubular atrophy and lympho-mononuclear infiltration (GLM 3): IgA, IgG, C1q, kappa and lambda light chains negative. Courtesy of Prof. Andrea Onetti Muda. The diagnosis was diffuse proliferative glomerulonephritis, extracapillary pauci-immune ANCA-negative. Two doses of steroid bolus (1 g) have been administered with progressive improvement in proteinuria up to 362 mg/24h in May 2013 but not in glomerular filtration rate. Therefore the patient continued to receive chronic renal replacement therapy. Pauci-immune glomerulonephritis is one of the most common causes of rapidly progressive glomerulonephritis. In the majority of patients there is the presence of ANCA serum antibodies that characterizes systemic or renal ANCA related vasculitis. However in a minority of cases (10-30%) ANCAs are negative 13. Patients with ANCA-negative pauci-immune crescentic glomerulonephritis are usually younger with a greater degree of 24-hour proteinuria, a higher prevalence of nephrotic syndrome and non-specific systemic symptoms (fever, weight loss, myalgia and arthralgias), as highlighted in our case 14 , 15. Our patient, a 69 year old woman with no history of vasculitic manifestations and systemic symptoms, resulted negative for systemic-pulmonary involvement as observed in HRCT, presented a negative screening of autoimmunity and showed a rapid loss of renal function. In this case only the renal biopsy permitted to detect the presence of advanced and irreversible kidney damage, revealed by the large number of fibrous crescents that testified the insidious nature of the disease. Infusion of steroid bolus was performed with progressive improvement in proteinuria but not in glomerular filtration rate. Cyclophosphamide and other major immunosuppressive drugs were not administered due to the irreversible nature of chronic renal lesions, as suggested by literature 16. Moreover, plasmapheresis was not performed because of the ANCA negative result in the absence of systemic involvement. In these cases in fact, plasmapheresis seems not to be associated with decrease of mortality risk in ANCA-associated vasculitis 17 , 18. 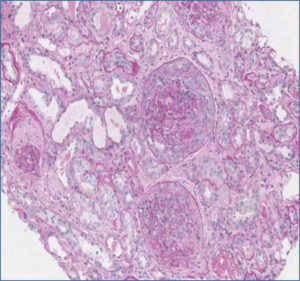 ANCA-negative pauci-immune crescentic glomerulonephritis is frequently associated with the presence of chronic glomerular lesions resulting in worse outcomes of renal function (Figure 2 A, B). Moreover, in those cases with onset in the elderly, the disease is generally more aggressive with a higher mortality rate that underlines the importance of making an early diagnosis. The standard therapy of ANCA-associated vasculitis is represented by cyclophosphamide and corticosteroids, while rituximab is administrated in patients resistant to standard therapy. However a high rate of infections, malignancies and cardiovascular events are associated with rituximab and cyclophosphamide use 19 , 20. Moreover, ANCA-negative pauci-immune crescentic glomerulonephritis are frequently associated with poor response to pharmacological treatment due to the presence of a large amount of chronic glomerular lesions, as in our case, that contraindicates the use of therapies with a high rate of adverse effects and costs. Renal biopsy is an important tool in order to evaluate severity and extent of renal involvement and to address therapeutic decisions. Especially in dialysis-dependent patients, the amount of sclerotic/ﬁbrotic lesions in renal biopsy may predict treatment response. The study from Hauer et al reported a significant correlation between degree of glomerulosclerosis in renal biopsy and worst renal function at 18 months follow-up 21. Inﬂammatory acute lesions may revert under immunosuppressive therapy, whereas glomerular sclerosis or interstitial ﬁbrosis progress despite treatment with immunosuppressive drugs. Considering the strong association of these drugs with severe and potentially lethal adverse effects 22 , it is mandatory to achieve new therapeutic options. Recent studies demonstrated that the MSCs exert benefits in glomerulonephritis, including lowering of proteinuria, prevention of renal impairment function and improving resolution of mesangiolytic damage in MSCs-treated kidneys 23 , 24 , 25. Mesenchymal stem cells are multipotent cells with regenerative properties, promoting tissue regeneration. In addition they have important immunoregolatory effects like the recruitment and expansion of T regulatory lymphocytes, inhibition of T cells, B cells and dendritic cells and reduction of TNF serum levels. These immunomodulatory characteristics make MCSs a potential therapeutic option in patients with refractory disease or contraindications to immunosuppressive therapy 26. A recent metanalysis of clinical randomized controlled trials examined the safety of MSCs treatment, founding no evidence of adverse events (acute infusional toxicity, organ system complications, infection, death, or malignancy) but only a significant association between MSCs administration and the development of fever 27. Recently it was reported the first case of a man with ANCA-associated vasculitis treated with infusion of MSCs, after the onset of complications due to immunosuppressive therapy. In this case, MSCs infusion was well tolerated and associated with clinical remission 28. In view of the important regenerative properties and contribution to glomerular cell turnover and repair of MSCs, stem cell based-therapy could be a good therapeutic option in order to reduce tubular atrophy, interstitial fibrosis and fibrotic crescents and to improve glomerular filtration rate, as alternative strategy to standard therapies. The most relevant contribution of our work is that it confirms the poor response to pharmacological treatment of ANCA glomerulonephritis, especially the ANCA-negative type, underling the importance of new effective therapeutic options such as stem cells. We thank Prof. Andrea Onetti Muda (Department of Human Anatomy, Campus Bio-Medico of Rome, Rome, Italy) who performed histopathological examination of renal biopsies. Chen M, Kallenberg CG, Zhao MH. 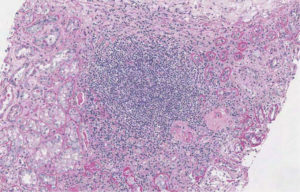 ANCA-negative pauci-immune crescentic glomerulonephritis. Nephrol 2009; 5: 313-318. Eisenberger U, Fakhouri F, Vanhille P, Beaufils H, Mahr A, Guillevin L, Lesavre P, Noël LH. ANCA-negative pauci-immune renal vasculitis: histology and outcome. Nephrol Dial Transplant 2005; 20: 1392-1399. Radfor DJ, Luu NT, Hewins P, Nash GB, Savage CO. Antineutrophil cytoplasmic antibodies stabilize adhesion and promote migration of flowing neutrophils on endothelial cells. Arthritis Rheum 2001; 44: 2851-2861. Ewert BH, Jennette JC, Falk RJ. Anti-myeloperoxidase antibodies stimulate neutrophils to damage human endothelial cells. Kidney Int 1992; 41: 375-383. Hung PH, Chiu YL, Lin WC, Chiang WC, Chen YM, Lin SL, Wu KD, Tsai TJ. Poor renal outcome of antineutrophil cytoplasmic antibody negative pauci-immune glomerulonephritis in Taiwanese. J Formos Med Assoc 2006; 105: 804-812. Harada T, Uzu T, Namba T, Yamamoto R, Takahara K, Yamauchi A. ANCA-negative pauci-immune crescentic glomerulonephritis complicated with recurrent massive gastrointestinal hemorrhage. Clin Exp Nephrol 2005; 9: 174-178. Miller A, Chan M, Wiik A, Misbah SA, Luqmani RA. An approach to the diagnosis and management of systemic vasculitis revised version with tracked changes removed. Clin Exp Immunol 2010; 160: 143-160. Gregorini M, Maccario R, Avanzini MA, Corradetti V, Moretta A, Libetta C, Esposito P, Bosio F, Dal Canton A, Rampino T. Antineutrophil cytoplasmic antibody-associated renal vasculitis treated with autologous mesenchymal stromal cells: evaluation of the contribution of immune-mediated mechanisms. Mayo Clin Proc 2013; 88: 1174-1179. Kunter U, Rong S, Djuric Z, Boor P, Müller-Newen G, Yu D, Floege J. Transplanted mesenchymal stem cells accelerate glomerular healing in experimental glomerulonephritis. J Am Soc Nephrol 2006; 17: 2202-2212. Suzuki T, Iyoda M, Shibata T, Ohtaki H, Matsumoto K, Shindo-Hirai Y, Kuno Y, Wada Y, Yamamoto Y, Kawaguchi M, Shioda S, Akizawa T Taihei. Therapeutic effects of human mesenchymal stem cells in Wistar-Kyoto rats with anti-glomerular basement membrane glomerulonephritis. PLoS One 2013: 8: e67475. Chen M, Yu F, Wang SX, Zou WZ, Zhao MH, Wang HY. Antineutrophil Cytoplasmic Autoantibody-Negative Pauci-immune Crescentic Glomerulonephriti. J Am Soc Nephrol 2007; 18: 599-605. Neumann I, Kain R, Regele H, Soleiman A, Kandutsch S, Meisl FT. Histological and clinical predictors of early and late renal outcome in ANCA-associated vasculitis. Nephrol Dial Transplant 2005; 20: 96-104. Harper L, Morgan MD. Plasma exchange for severe ANCA-associated vasculitis? Am J Kidney Dis 2011; 57: 532-535. Hauer HA, Bajema IM, Van Houwelingen HC, Ferrario F, Noël LH, Waldherr R, Jayne DR, Rasmussen N, Bruijn JA, Hagen EC; European Vasculitis Study Group (EUVAS). Determinants of outcome in ANCA-associated glomerulonephritis: a prospective clinico-histopathological analysis of 96 patients. Kidney Int 2002; 62: 1732-1742. Kelesidis T, Daikos G, Boumpas D, Tsiodras S. Does rituximab increase the incidence of infectious complications? A narrative review. Int J Infect Dis 2011; 15: e2-16. Wall N, Harper L. Complications of long-term therapy for ANCA-associated systemic vasculitis. Nat Rev Nephrol 2012; 8: 523-532. De Miguel MP, Fuentes-Julián S, Blázquez-Martínez A, Pascual CY, Aller MA, Arias J, Arnalich-Montiel F. Immunosuppressive properties of mesenchymal stem cells: advances and applications. Curr Mol Med 2012; 12: 574-591. Lalu MM, McIntyre L, Pugliese C, Fergusson D, Winston BW, Marshall JC, Granton J, Stewart DJ. Canadian Critical Care Trials Group. Safety of cell therapy with mesenchymal stromal cells (SafeCell): a systematic review and meta-analysis of clinical trials. PLoS One 2012; 7: e47559.